An engagement planning calendar doesn't necessarily have dates. In bookstores, couples can find planners, guides, and how-to books for every aspect of a wedding, but engagement planning calendars are often unheard of. In truth, many people wonder why they need to plan their engagement at all - isn't it just popping a question? There are many things that go into a successful engagement, however, and knowing how to plan for them will ensure a memorable beginning to happily ever after. 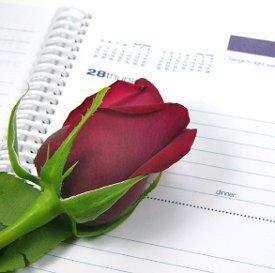 Unlike most planning calendars, a calendar for your engagement may not have a single scheduled date or appointment. Instead, it is a checklist of the tasks that a soon-to-be or recently-engaged couple needs to accomplish as well as a list of topics they need to be sure to address on their way to the alter. While some bridal guides suggest doing these things after becoming engaged, in many cases a difference of ideals or philosophies may lead to a broken engagement that is much more painful to deal with than if the couple had discovered their incompatibility earlier. To create an engagement planning calendar, find a suitable notebook or journal to record important information and topics so they are not forgotten. A book that can be divided into three sections (before, during, and after the proposal) is helpful. The planner should not include specific dates for different steps until it becomes necessary (setting an appointment with a jeweler to view rings, for example), since the engagement should be based on the couple's mutual readiness to progress in their commitment rather than arbitrary dates. Every couple's engagement planning calendar will be different, based on their relationship and what is important to their happiness, but the ideas presented here are a solid guide to help couples remember critical issues. Before the Question: This is the dating or courtship period before the question is asked or the ring is presented. During the Proposal: This is the actual marriage proposal and the pivotal event of the engagement. After Yes: This is the period of euphoria after the proposal when the engagement is announced and celebrated before wedding planning begins. Knowing what issues to discuss and what to plan for in each stage will help couples have a hassle-free engagement. Religious Beliefs: church affiliation, attendance, and spirituality. Career Plans: continuing education, promotional advancement, and other long term goals. Parenting: which parent (if either) may stay home with children, how many are desired, when, etc. Finances: Loans, debts, and spending habits. Lifestyle: Cleanliness, grooming, housework, diet, home ownership, etc. Personal Values: Honesty, integrity, hard work, independence, etc. Meet one another's parents and families, if possible. This helps them integrate their relationship into the family network and cultivate a support network for their life together. Experience different phases of daily life together. By knowing how one another looks and acts while sick, when first waking up, and after a bad day at work, the couple can realistically gauge the day-to-day routine of life together rather than base their relationship on short duration dates. Once the couple is comfortable with one another and considering moving their relationship to the next level, it is time to start planning for the proposal itself. The proposal should be perfect. Learn which ring design is most appropriate for the bride-to-be, including stone type, shape, metal preference, setting, and ring size. Learn about diamond quality in order to find a ring that is not only beautiful, but a sound purchase. Procure the heirloom ring if one will be used. Discuss a budget for the ring itself. Discover what type of proposal is most appropriate for the relationship: romantic, creative, or the classic on bended knee. Making dinner reservations if necessary. Having the ring cleaned to look its best. Generating explanations to coordinate the event without suspicion. Planning suitable alternatives if the initial intentions go awry. With careful planning, the simple yet significant question will become a treasured memory for many anniversaries. Once the question has been answered - hopefully in the affirmative - the couple has a few remaining details on their engagement planning calendar before they delve into wedding planning. Announce the engagement to family and friends. Take pictures or portraits if desired. 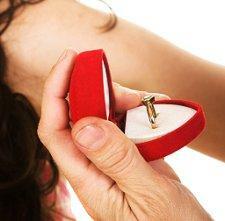 Discuss engagement party plans if necessary (though the couple themselves should not suggest either a party or gifts). While there is not much to do immediately after the proposal, taking time to celebrate the engagement will ensure the momentous period is not lost in the rush of wedding planning. Successful engagement planning does many things: familiarizes the couple with one another beyond a superficial level, ensures a flawless proposal, and celebrates the couple's new status. By following the guidelines of an engagement planning calendar, couples can progress to the next level in their commitment without regrets, inconveniences, or disappointments.